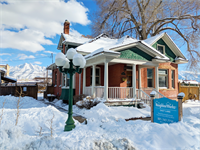 At NeighborWorks Salt Lake, we work to revitalize neighborhoods house by house, block by block, neighbor by neighbor. We do this by building on the strength of our neighborhoods, creating opportunities through housing and resident leadership, and contributing to the development of our youth and local economy. •	Providing low interest loans for first time homebuyers unable to secure financing through traditional lending institutions. •	Providing home improvement loans for homeowners to address health and safety issues, preserve existing structure, and build additions to accommodate growing families. •	Creating a sense of community through well-planned and inclusive affordable housing development that includes new construction, reconstruction and in-fill housing. •	Sponsoring special events that promote community beautification, cultural awareness, resident participation and empowerment. •	Providing resident leadership training and education that promotes neighborhood mobilization and civic participation.